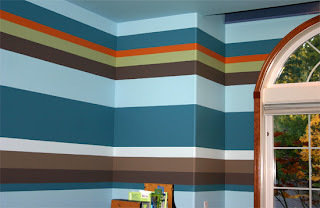 A young girl's bathroom and bedroom. 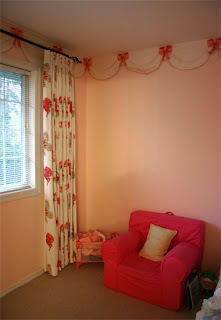 Both rooms have the same butterfly fabric which was used as the design jumping off point. 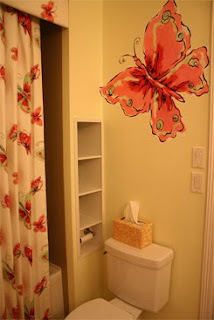 In the bathroom (above) I painted butterflies around the room and in the bedroom I painted faux fabric around the crown with faux ribbons holding it up here and there (below). 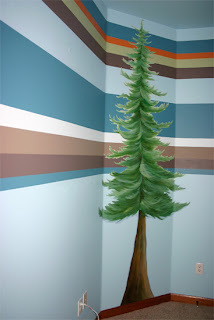 This young boy's room features stripes of different widths and incorporates a tree I had painted years ago when the room had a much younger theme.